As a resident, you're one of 551 home owners in our neighborhood. Harrison Pond began its development in 1988. Since then, Harrison Pond has had the honor of hosting the Parade of Homes two years in a row. Those homes set the tone for the style and comfort of the rest of the homes in our neighborhood. Since its completion in 2005, all our residents enjoy our beautiful managed community. One of the responsibilities of every homeowner is to pay the yearly assessment. The assessment covers the care and maintenance of the seven entrances to the neighborhood, pond and fountain maintenance, maintaining the gazebo, stocking the pond with fish, common area green spaces including landscaping, sprinkler systems and mulching, pool maintenance and management, the playground, street signs, and any emergencies that arise. By moving into the Harrison Pond community, you have contracted with the Association to pay a yearly assessment. The Board determines the assessment rates based on the payments received by all neighbors. The Board of Trustees is empowered to exercise the placement of liens and subsequent foreclosures on all homeowners who are not in good standing with their assessment payments. Harrison Pond is named after Mr. Harrison, the original owner who was a lawyer and "gentleman farmer." Harrison Pond began as a horse farm when the Rocky Fork Hunt Club used to hold fox hunts on the property. The original Harrison homestead was located at the site of our pool & shelter house. The remaining land was cornfield, woods, and the pond. As late as 1992, our neighborhood was actually part of New Albany, though was subsequently annexed to Gahanna. This is why we have a New Albany mailing address: for the convenience of the original homeowners it was never changed. The three “corral” areas along Morse Road are still owned and maintained by The New Albany Company, but all our services come from the City of Gahanna, and of course, we are part of Gahanna School System. Now that our neighborhood is complete, we have 551 homes, a pool and pool house, the “big pond” surrounded by a walking path and Gazebo. 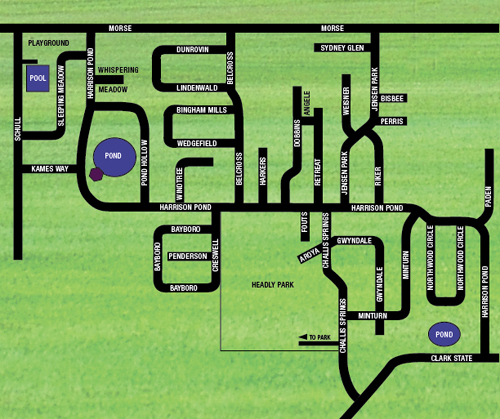 We’ve built a playground by the pool, and on the eastern end of the neighborhood we have Headley Park, which is home to the Gahanna League soccer fields. If you are currently a homeowner in Harrison Pond, you will find great information in the HP News, Upcoming Activities, and Message Board areas. If you sign up for your Username and Password, you can subscribe to receive notices by e-mail for new postings. You can even post your own information on the Message Board. Also, visit the recommended contractor area to learn about businesses your neighbors have had good experiences with. If you are considering making Harrison Pond your home, you can browse the public access areas of the site to learn about our by-laws, see the volunteers who serve on our Board and Committees and even e-mail individuals for more information. View information about our award winning schools and public services available to our neighborhood. You will find valuable links to help you learn about our area. Either way, we hope you enjoy your visit to our website and come back often to see the new information! Harrison Pond is managed by Towne Properties.